It feels like just yesterday that Slightly Stoopid’s 2017 summer tour announcement lit up my live music radar. It was a chilly winter morning, and warm as those fresh Texas tour dates were, summer felt so far away. 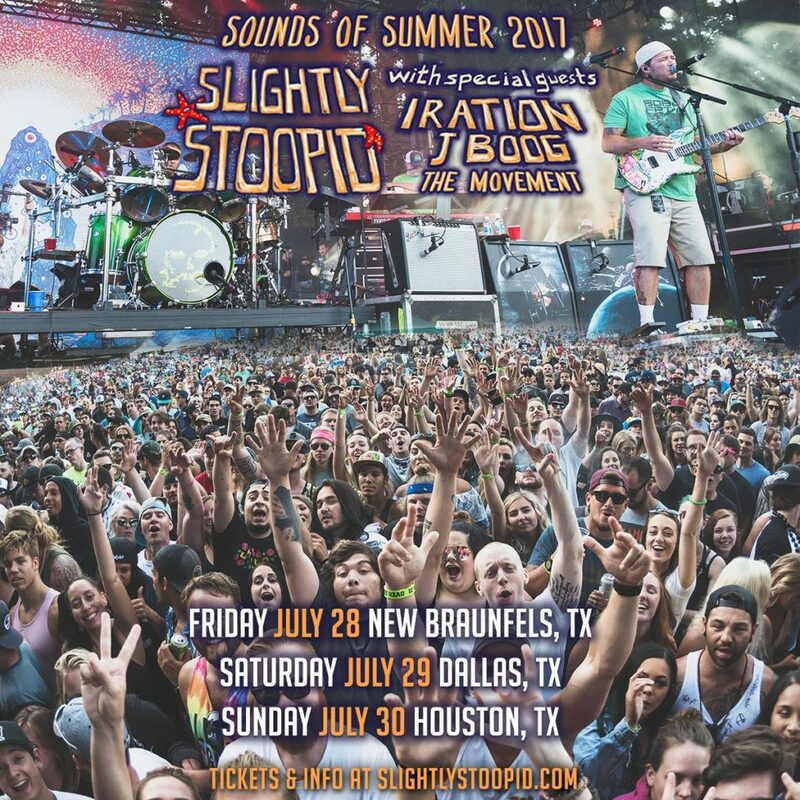 Then I wake up and it’s the end of July – and Slightly Stoopid is pulling up in a hazy cloud of dubbed-out reggae rock vibes with Iration and J Boog in tow for the Texas leg of their Sounds of Summer Tour. I’ll be checking out the madness at Whitewater Amphitheatre in New Braunfels this Friday, July 28. You can also catch them in Dallas and Houston on the 29th or 30th, respectively. Can’t wait for that fat sack of sweet, sticky-icky vibes? This freshly released music video for “One Bright Day” off of Meanwhile… Back at the Lab should hold you over. The video is comprised of animated stills procured from large canvas paintings donated by Hawaii-based artist and aspiring pro-surfer Danielle Zirk. Original art from the video will be auctioned, with proceeds donated to Global BrightLight Foundation. The Global BrightLight Foundation provides practical, affordable solar energy solutions to rural communities that currently lack access to electricity. There are over a billion people worldwide who are forced to use candles, kerosene, and batteries to power their lives. These fuels are expensive, dangerous, and make it impossible for children to study and achieve their full potential. By harnessing the power of the sun, GBL is saving families money and improving their health, safety, and educational outcomes. GBL has deployed over 74,000 solar lanterns since 2011 impacting the lives of 358,000 lives. We love music. We love great causes. We especially love when they come together for the greater good of society and our earth! Forget camping at the lake or studying for summer semester.